8.43 (C). A hollow steel shaft is subjected to combined torque and internal pressure of unknown magnitudes. In order to assess the strength of the shaft under service conditions a rectangular strain gauge rosette is mounted on the outside surface of the shaft, the centre gauge being aligned with the shaft axis. 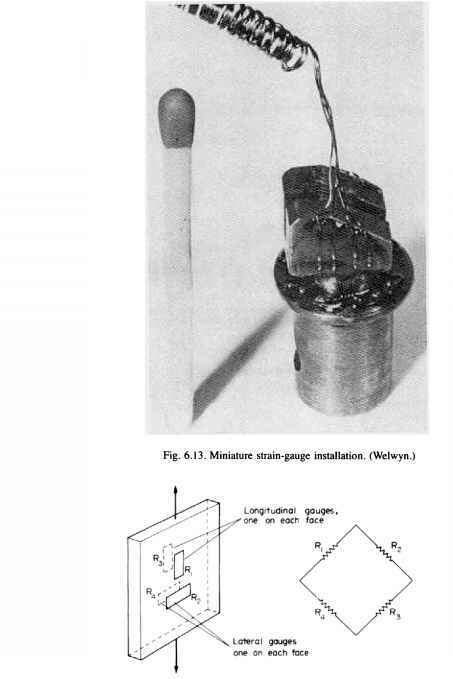 The strain gauge readings recorded from this gauge are shown in Fig. 8.47. Draw complete Mohr's circle representations of the stress and strain systems present and hence determine the maximum shear stresses and maximum shear strain. 8.44 (C). At a certain point in a material a resultant stress of 40 MN/m2 acts in a direction making angles of 45°, 70° and 60° with the coordinate axes X, Y and Z. Determine the values of the normal and shear stresses on an oblique plane through the point given that the normal to the plane makes angles of 80°, 54° and 38° with the same coordinate axes. 8.46 (C). Derive the differential equation in cylindrical coordinates for radial equilibrium without body force of an element of a cylinder subjected to stresses o>, og. dr dr where v is Poisson's ratio. where the coordinates are as shown.